Lang Toi is a beautiful, humorous, lighthearted depiction of daily life and culture in a Vietnamese village expressed through circus and theatre art forms. And this performance made me smile from the moment I sat down to the moment I left the Regal Theatre as the Nouveau Cirque Du Vietnam performers farewelled us with energetic traditional music. The circus elements throughout the performance were undoubtedly spectacular – the phenomenal high-flying acrobatics, the superhuman contortion and the hair-raising balancing acts – but what was extra special about this show was the theatrical elements that transported you straight into the heart of Vietnam. The realistic representation of life in a village took us on a journey, and at times it felt like I was slowly floating down the Mekong Delta secretly watching from the periphery as uninhibited life played out before me. Young lovers playfully flirting amongst the bamboo, older men smoking and younger women cooking, lines of workers picking rice, moments of reverence in a temple, real joyful camaraderie and roaming haunted spirits. Every facet of life in a village was explored, and it felt so natural and real, seamless and flawless. 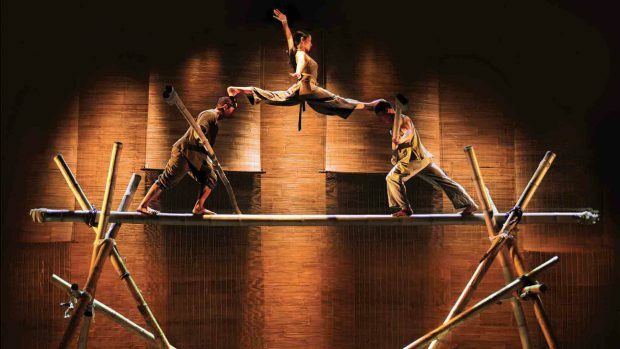 It was truly incredible watching the performers create the stage around them, expertly crafting elaborate structures from bamboo, rope and what seemed like rubber, seemingly floating across them as they balanced and flipped and contorted, creating exquisitely beautiful tableaux, impossible to tear your eyes away from. The bamboo pieces were extensions of their limbs, pitched and propelled around the stage in mandela-like patterns sometimes as if by magic, creating teepees, scaffolds and pathways; the transitions so smooth from scene to scene. Every part of the stage was used, from the intimate scene of the three wise monkeys, sitting in the centre of downstage, playing out a fun juggling act to the soaring bamboo constructions that almost reached the lighting rig, as a young performer balancing effortlessly on the head of another. When it was needed the lighting design was dark and moody, the performers silhouetted against a dusky blue backdrop and, when the elegant high flyers flew through the air on ropes or bamboo, the lighting was bright and inviting. However, there were moments where it was difficult to see the action on the stage because it was too dark. At some points, the transitions of fading in and out were out of time to the performance, so that when the stage was finally illuminated, some actions were half-finished. The music and sound effects were beautiful, unique and accompanied the action on stage perfectly. It was haunting and dark at points and then playful and lively, there were psychedelic sounds followed by traditional folk songs sung by the performers. The four-piece orchestra, two musicians on either side of the stage, sat surrounded by various traditional instruments that produced some incredibly unique sounds throughout the entire performance. An unmitigated delight for the senses, this is another must-see show at Perth Festival. The technical aspects of circus, mixed with the contemporary aspects of theatre and the traditional storytelling gave the audience an insight into the beauty and wonder of unique Vietnamese culture.